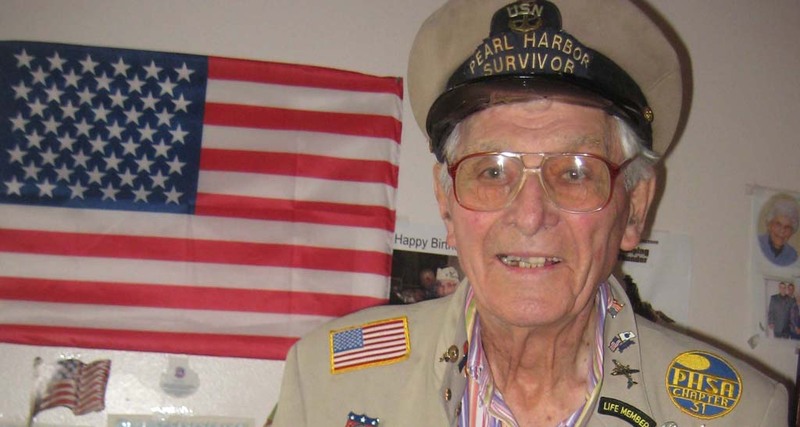 OCEANSIDE — Adolph Kuhn, 91, belongs to an elite fraternity of Pearl Harbor survivors. There are so few today that the Pearl Harbor Survivors Association, once boasting 58,000 members, disbanded a year ago. Speaking invitations from schools have dwindled, too. After all, why should kids these days be interested in Pearl Harbor? Biographer Jim Hoffmann has some strong opinions. In 1999, he was a young American history teacher when he befriended Kuhn after reading an article about him. To Hoffmann, World War II veterans are patriots he compares to America’s founders. “The American Revolution gave us life,” he said. “People died knowing what our country was going to become. The Civil War kept us alive. Kuhn enlisted in the Navy in 1940, five days after graduating from high school. Landlocked on a farm in Kansas all his life, he fantasized about working on a ship one day. After graduating from aviation metal smith school at Pensacola, Fla., he was transferred to the San Diego Naval Destroyer Base, then boarded the USS Boise en route to Pearl Harbor where he was assigned to the assembly and repair department at Ford Island Naval Air Station. Standing 6 feet 5 inches tall, Kuhn had to curl his toes to squeeze his size 15 feet into size 12 shoes. The Navy didn’t carry anything larger than a 12. Kuhn had been in Pearl Harbor for 19 months, and was fortunate to have a cousin who lived off base. All 14 naval vessels were in the harbor on Sat., Dec. 6. In fact, they competed in a battle of the bands with other ships that afternoon. The USS Arizona won by playing The Ink Spots hit, “I Don’t Want to Set the World on Fire.” The prize was the privilege to sleep in late the next morning. Later, Kuhn met up with his cousin at the Black Cat. Afterwards, they returned to his home. As Kuhn made his way to the base, a Japanese plane shot at him so low that he could see the pilot’s gold teeth as he laughed. A soldier fleeing on foot was decapitated by machine gun fire before his eyes. Kuhn was lucky to have survived. “I was the tallest sailor, the biggest target, and I was saved 19 times by my guardian angel,” he says in hindsight. Kuhn volunteered to board the USS Arizona, but wasn’t prepared for the carnage. He grabbed the hand of one man, charred to the bone, his eyes gone, who slumped to the ground and died. Last year Kuhn returned to Pearl Harbor with his son and grandsons for the 70th anniversary. Afterwards, they visited the museum where they discovered a photo of Kuhn they never knew existed. What’s more, the Navy never identified the tall sailor in the picture with bombs exploding around him. Kuhn has written books about his war experiences based on his private journals. He has donated $19,000 from the sales of the books to veterans’ organizations.